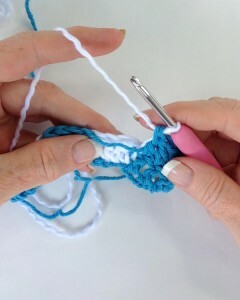 There are many variations of the crochet check stitch. 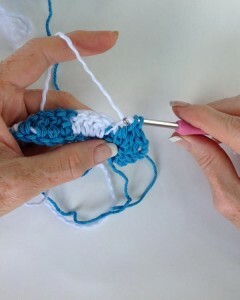 Check stitches are created using everything from single crochet stitches to taller double and triple crochet stitches. The width and the height of the boxes that make up the check pattern also very greatly depending on the crochet pattern you are following. 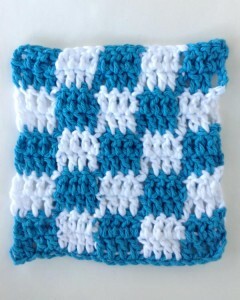 Over the years I have used the crochet check pattern in many designs. 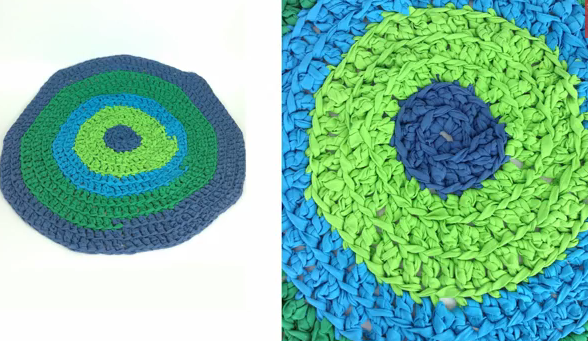 Try using this pattern to create all kinds of crochet fashion and home decor items – including rugs, hot mats, potholders, afghans, purses, hats and more. As you’re working your stitches and changing your yarn back and forth you can carry yarn across the back of your piece or you can work over the yarn as you go. Both ways are shown below. When you carry the colors you want to make sure that your gauge is a little bit on the tight side so that the carried yarn does not show through to the right side of your work. The advantage of working over the colors is that you don’t have the strands running across the back of your piece. 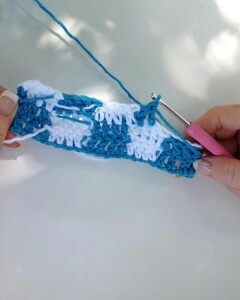 The disadvantage is that sometimes those carried strands shadow through to the right side of your crocheted piece. It is all matters of preference, some people prefer carrying the yarn colors others prefer working over them. 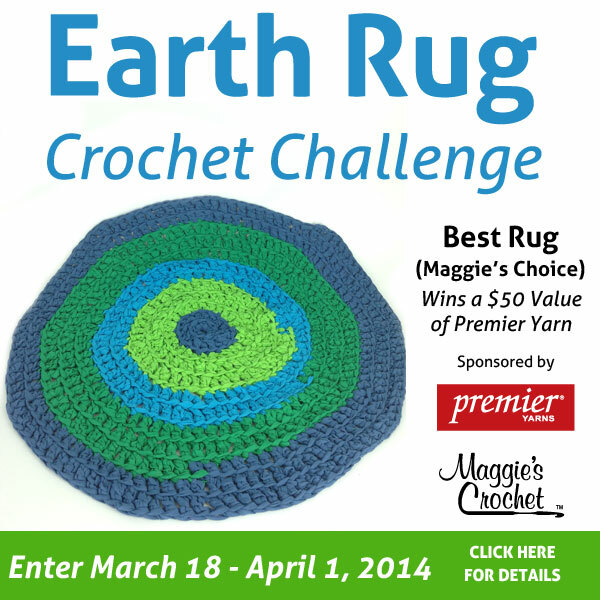 As soon as you try the check pattern crochet something with it and post it here in the comments. I would love to see what you make. 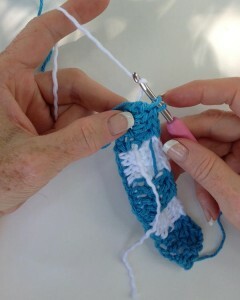 I promise you that once you get the hang of this stitch it’s a lot of fun to do. 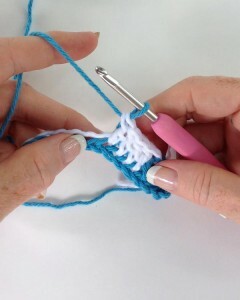 I hope that this tutorial helps you to master the crochet check stitch. If there is any crochet technique or skill that you need help with, let me know. I am here to help you. Watch my video or continue reading for a step-by-step photo lesson. 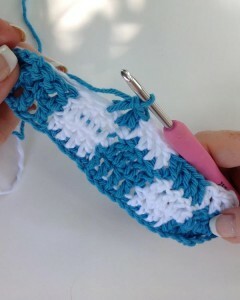 1- For this stitch sample you will need two colors of contrasting yarn, a crochet hook size G or H inch and scissors. 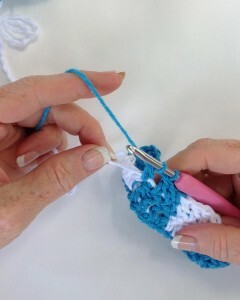 ( add metrics for sizes) I am using the Tulip Etimo hook from the Rose Crochet hook set. I love love love these. 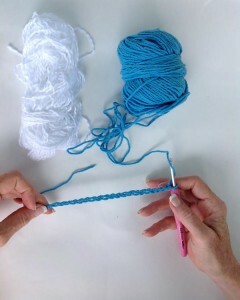 2- Starting with your main color (MC) of yarn, crochet a chain that is a multiple 8 plus 6. For the sample I chained 16 and then I chained 6 which is a total of 22 chains. 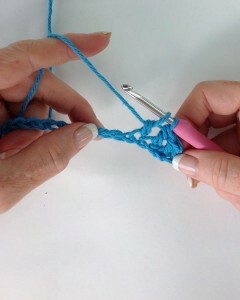 3- Double crochet in the fourth chain from hook and in the next chain. 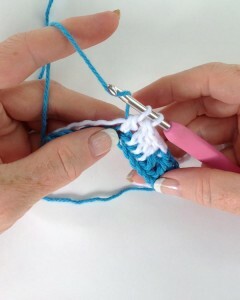 4- Work the fourth double crochet stitch until there are two loops left on the hook. 5- Now you are ready to join a new contrasting (CC) color. 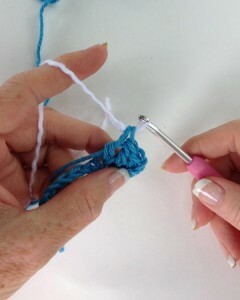 Make a slip knot with the new contrasting yarn color and slide it onto your crochet hook. 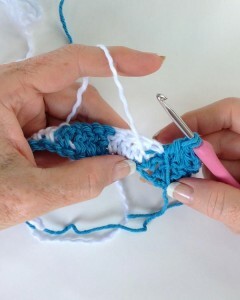 6- Draw the new yarn color through the last two loops of the fourth double crochet to complete the crochet stitch. 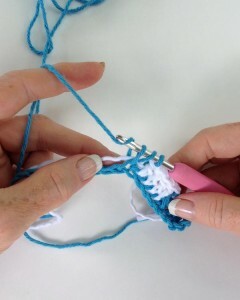 7- Lay the unused color along the foundation chain and work your double crochet stitches over the unused strand and into the foundation chain. 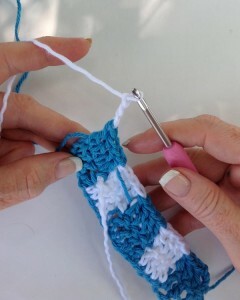 With the new color work a double crochet stitch in each of the next three chains. 8- Work the fourth double crochet of this color block until there are two loops left on your, drop your contrasting color and pick up your main color and yarn over your hook with your main color yarn. 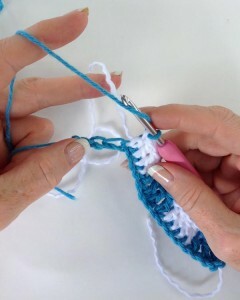 9- Draw the main color yarn through the remaining two loops on your hook to complete the fourth double crochet stitch of the contrasting color block. 10- With the main color yarn and working over unused contrast color yarn start the next block with main color yarn. 11- When working the last main color block of row one, you do not have to work over the contrasting color because Row two starts with the same color block. 12- At the end of row one chain three turn with the main color. You do not have to change colors for the first block. 13- This is a view of the wrong side of the check pattern. 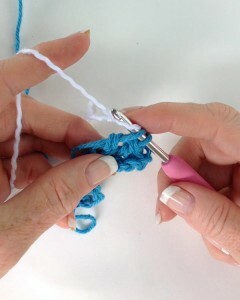 You want all strands and yarn changes happen on the wrong side of your work so it doesn’t show on the right side. The first main color yarn block is worked and I am getting ready to change to my contrasting white yarn. 14- I have done a yarn over my crochet hook with my new contrasting color and drawn it through the last double crochet of my main color block. 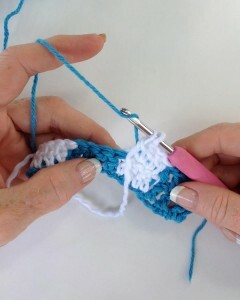 15- Lay the unused yarn color along the top of the next four double crochet stitches from the previous row. 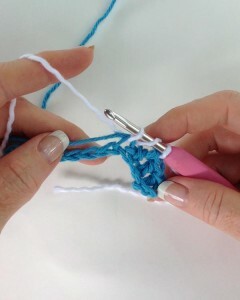 Work the next double crochet stitches over the unused strand of yarn. 16- Is this picture you can see they carried blue color on the wrong side of the piece. 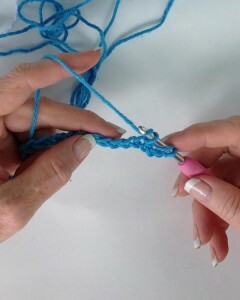 It is best to you have a tight gauge so that the carried strands don’t show as much. 17- Just before you get ready to change to the alternate color of yarn, tug just a little bit on the carried color to make sure it’s not to loose underneath the stitches that were worked over it. Make sure you do not pull to tightly. 18- Instead of working over the strands you can drop the unused color to the wrong side and pick it up as shown in this picture. 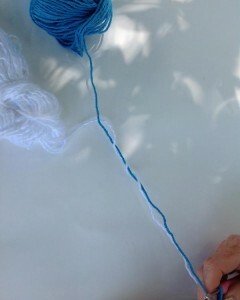 19- Notice the carried blue strand in the picture. I worked over the white on the last block so that I could change to white at the end of the last stitch of the last block. 20- Row 3 – change return with contrasting color. 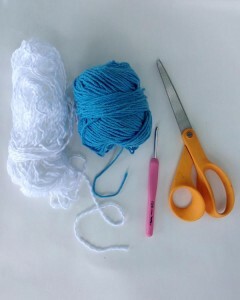 21- The yarn will get tangled. When it does, just flop one ball over the other. 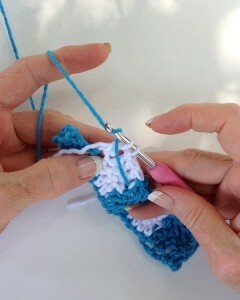 22- Row 3 – see how the check crochet pattern looks from the right side. My gauge is loose and you can see the carried strands of yarn. 23- Here is what the wrong side looks like. 24- Here is the finished sample. 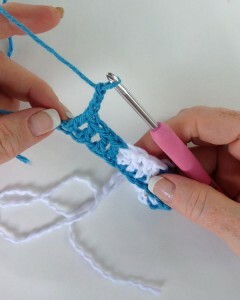 With this how-to tutorial and a matching YouTube video you are guaranteed success at mastering the crochet check pattern. If you liked this post, check out our how-to on making wall art out of vintage lace doilies. Hi Diane, Thank you for reading and happy crocheting.